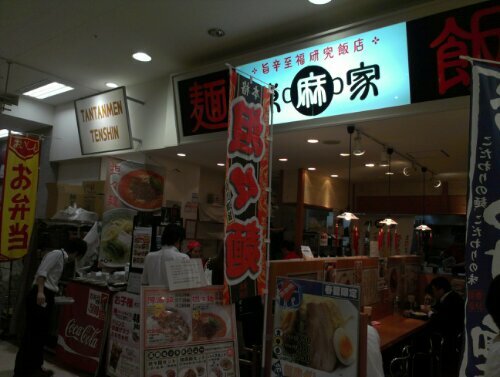 @Shinagawa Seaside | Get Your Grub On! The Ten Levels of Fury! Today two of my colleagues invited me to join them for lunch around the corner from the office in Shinagawa Seaside. 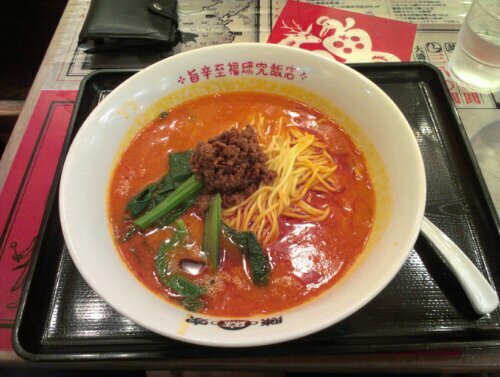 In the foodcourt at the Jusco supermarket there is a small cantine like noodle shop with some really decent ‘Tantanmen‘ – ‘Tantanmen Tenshin’ – which I had tried some years back when I was here the last time. This shop has ten levels of spiciness for their noodles and as my colleagues warned me upfront and they took levels one and two, I didn’t dare going any further than level three which turned out to be a very smart move. Picking up my bowl from the counter I realized that it had the most drops of red chili oil swimming on the surface compared to the ones from my colleagues. Now this was nice. The creamy sesame broth was rich and thick and strong in taste and the heat, even that not overwhelmingly painful, instantly squeezed out some sweat drops from my forehead. The noodles were good but not the homemade kind and surprisingly bright yellow in color. The minced pork gave it all a nice meaty touch and some chinese greens added extra layer of texture and something cooling to the otherwise heaty pot. After I had finished everything I wondered if I should have taken it up a notch on the spice scale but my stomach proved me different by growling for the rest of the day. This is a simply shop I wish I had also close to my workplace but maybe it’s better that way as I probably would have it to often which either would drive my weighing scale through the roof or leave me with holes in my stomach whilst trying to push the levels up. BURN.